I did a really cool thing today. I got to feed a Sea Otter at the aquarium, as a special treat. A group of us went backstage to the holding pen for the Otters, and Maggie was our lucky duck who got to hang out with us, on the other side of a glass partition. Maggie is about 10 years old and weighs 42 lbs. I was told she gets fed about 8lbs of fish and mollusks a day, and that she sleeps somewhere between 10 and 16 hours. I think I would enjoy eating a fourth of my body weight daily and napping the rest of the time. However, her frame holds it better than mine would. Up close, she looked kind of like a really big Meerkat, but she kept jumping in and out of the water, which i’ve never seen Meerkats do (although, i’m no meerkat expert). Seeing Maggie walk on land was like watching a fish out of water. Awkward to be polite, bizarre to be more accurate. She had this kind of limping gait, and her back legs really looked more like flippers. Hypothetically she was walking, but she looked like she was just struggling until she dived into the water. Otters are cool. They are adorable, for one. Maggie had chubby cheeks and little alien ears, as well as soft eyes and a wet nose. Well, a wet everything. Her fur was constantly dripping. Hi there, Cutie. Want a shrimp? How about a cuddle? And you should have seen her eat! It was just, too much for words. Clams and such she would just take, but i’ve never seen any body peel shrimps faster. She left a neat pile of shells on the ground in front of the hole. What hole, you ask? 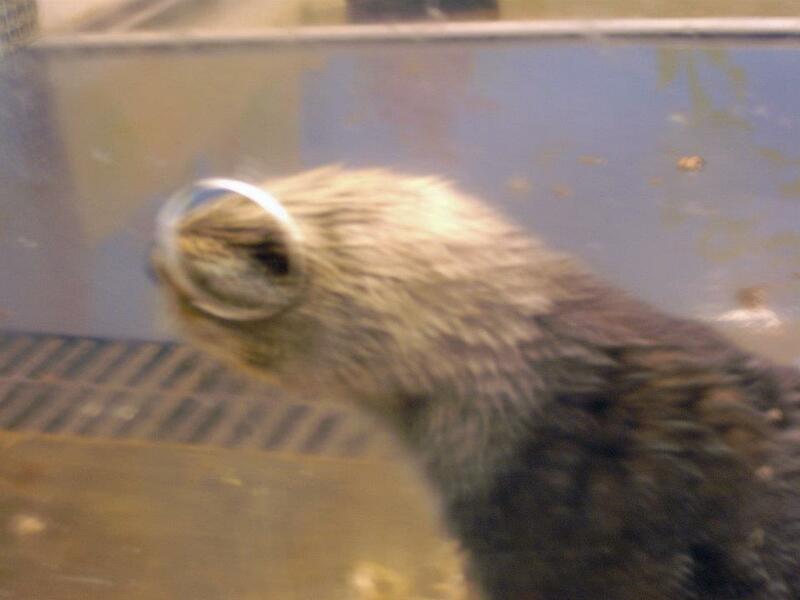 Well, we fed Maggie through a hole in the glass because Otters are vicious little fuzzbots as well. Fun fact, they are actually the only animal at the Aquarium that divers are not allowed in the water with. This is including those sharks everyone seems so worried about. Apparently we should be focusing our worry on these teddy bears of the ocean. But I can’t hold it against them, when you are that cute of a morsel, you need a sharp bite to protect yourself. All the otters at the Aquarium can’t be rereleased in the wild. They have some sort of varying disability that prevents them from being able to exist in the wild. Living in a zoo like setting really eases up survival. For instance, Maggie is missing a few teeth. Not a big deal at all in the clink, but in the brutal Pacific, that’s a game changer. She’s also really old. Granted, when I was her age I was in 4th grade, but I believe she’s the equivalent of an Abuela now. I mention this because Sea Otters are still a recovering species, and the Aquarium cannot in good faith hold on to a healthy otter that could go forth and boost the wild population. Multiple times now they have been pushed to the edge of extinction. Humans kill them for their pelts, oil spills stick to their shiny fur, and of course, pollution, pollution, pollution. My good looks mean I get paid a little less, but also that people love me more. I don't believe in the glass ceiling. Just this glass partition. But Sea Otters have something working for them, and I’ve mentioned it already in this blog, multiple times. They are adorable little fuzzy wuzzies who eat food off their chubby bellies and connect to each other while they are sleeping. Although they are fierce, and the top of their food chain ( their main predators off this local coast of California being Sharks, and further north being Orcas) we see them as Teddy bears, deserving of hugs and protection. So I’m still riding high on my Otter Encounter today. Very cool to be so close to such a unique and charismatic animal. Photo Courtesy of Carlos Barrios. Thank you very much Carlos. 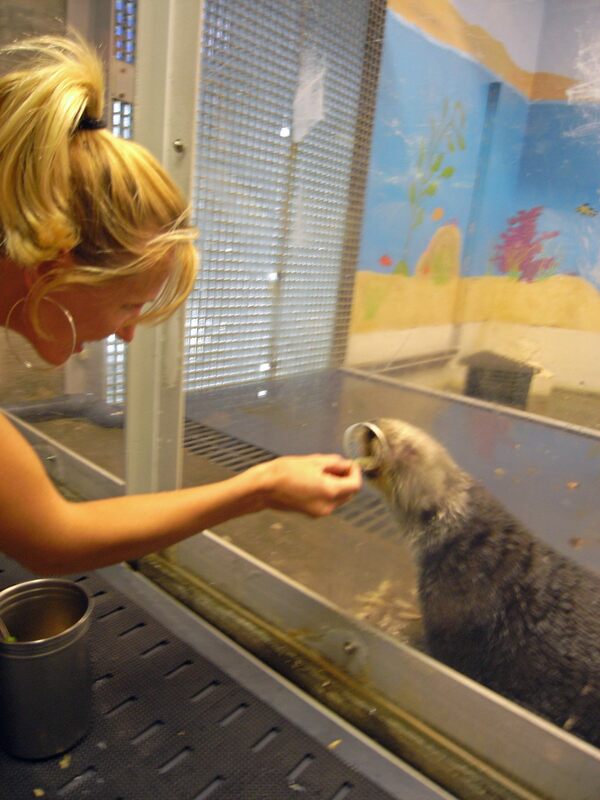 You got to feed a otter! Wow! Up in Northern California we only have river otters left. I don’t have much experience with ocean otters. I did end up about 4 feet from a river otter in the ocean once. It was up at college cove up in Humboldt. I was freediving and when I popped up there was a mother and it’s baby little otter pup. I scared the pup when I came up and it made a little squeak sound. I backed up and watched them go on a rock the mother fed the pup a small crab. It was only like 4 inches long. Very adorable. I’m a big fan of otters!